Hello dear vapers! Today we will introduce the Geekvape Cerberus – a fabulous sub-ohm tank, featuring many recent features that are just waiting to be explored! An interesting one, that is definitely turning the heads of vapers is the super mesh coil system. The Cerberus is perfectly compatible with the Geekvape NOVA 200W TC Box MOD and they look great together. Carry on reading to find out more! One main feature is the top filling system. Making filling up much easier. 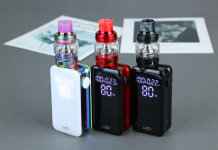 With the innovative super mesh coil system (as previously mentioned) and the adjustable bottom airflow design, it will bring you a great and convenient vaping experience. It also features a clip-on top cap, which makes the top filling even more convenient. You just need to rotate the top cap 90° and remove it then you could refill liquid from the liquid slot. It can avoid leakage effectively. The Cerberus Sub Ohm Tank is constructed of high-quality stainless steel and pyrex glass. It comes in 5 funky colors; SS, Gunmetal, Blue, Rainbow, and Black. Personally, as always, Rainbow is my favorite. For me, it is perfect going into gloomy winter, it adds that splash of color that people need. The Cerberus tank is compatible with super mesh coil which is made of KA1 material and supports a 0.2 ohm resistance. It is also compatible with TFV8 Baby coils. So you can keep on clouding up! So we have established that the Geekvape Cerberus 25mm Sub-Ohm is a well-designed device. 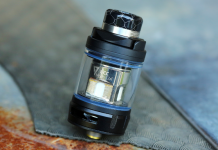 The Cerberus Sub-Ohm tank measures in at 25mm at the base, but increases to 27mm at the widest point using the included bubble glass expansion to upgrade the e-juice capacity from 4ml to 5.5ml, depending on what you want. It has an adjustable dual-slotted bottom airflow ring to control the inlet of air to create conditions conducive to vapor or flavor production too. The Cerberus Sub-Ohm tank is able to access the Super Mesh Coil Line, utilizing offerings like the X1 coil, best rated for 60-80W. That’s it, folks, short and sweet, everything you need to know about the up and coming Geekvape Cerberus Sub ohm Tank 5.5ml. There are quite a few great features to look forward to, don’t you think? It is available for pre-order on most sites for a decent price of around $32, some might be a bit cheaper, so get your bargain hunting hats on! Sub-ohm tanks are super trendy at the moment so don’t get left behind and get yourself a good one before it’s too late!